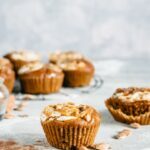 Delicious and healthy pumpkin spice muffins easy recipe. Ideal for your Halloween! Preheat your oven at 170°C. Start by whisking - using a hand mixer - the oil, vanilla extract and brown sugar until you obtain a smooth and creamy mixture. It won't be creamy as if you beat sugar and butter, it'll be more liquid. Add the eggs and whisk again, then combine together the pumpkin puree. Sift the flour with salt and cinnamon, and gradually add it to the mixture. Stir with a spatula until you have no clumps. Finally, add baking powder, baking soda and half a teaspoon of vinegar (on top of your baking soda so it forms bubbles). Stir. Fill muffin tin (or fluted paper cases) 3/4 full. Mix cream cheese and icing sugar and a top each muffin with about 1 tablespoon of the mixture (use a toothpick to swirl it). Bake for about 40/45 minutes or until a toothpick inserted comes out clean. Let them cool onto a cooling rack.